“The StarSpangled Banner” was officially made the national anthem by Congress in 1931, although it already had been adopted as such by the army and the navy. Background – Francis Scott Key, a lawyer, visited the British fleet in Chesapeake Bay to secure the release of Dr. William Beanes, who had been captured after the burning of Washington, D.C. The release was secured, but Key was detained on ship overnight. In the morning, he was so delighted to see the American flag still flying over the fort that he began a poem to commemorate the occasion. 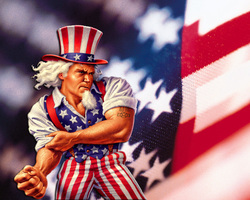 That poem became thelyrics to the Star-Spangled Banner; the music was a popular British song. 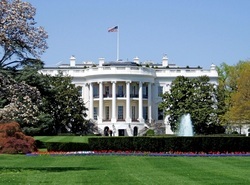 White House – official home of the United States President and family. Recognized as the symbol of the United States, the President and the President's administration the White House also houses offices of the executive branch and is the location of official State receptions and dinners. 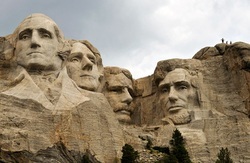 Mount Rushmore – carved into the granite face of Mount Rushmore near Keystone, South Dakota, Mount Rushmore features 60-foot sculptures of the heads of United States presidents (in order from left to right) George Washington, Thomas Jefferson, Theodore Roosevelt, and Abraham Lincoln. The statue reminds us of the leadership and contributions to the nation made by these men.